Facebook ROI: Are Facebook Ads A Waste Of Money? Facebook ROI: Are Facebook Ads A Waste Of Money? Ep 8. – Are Facebook Ads A Waste Of Money? Well that set me back a bit. Because for me, my immediate answer is no. And this is a common refrain heard from those who have been unsuccessful with their Facebook ad campaigns. 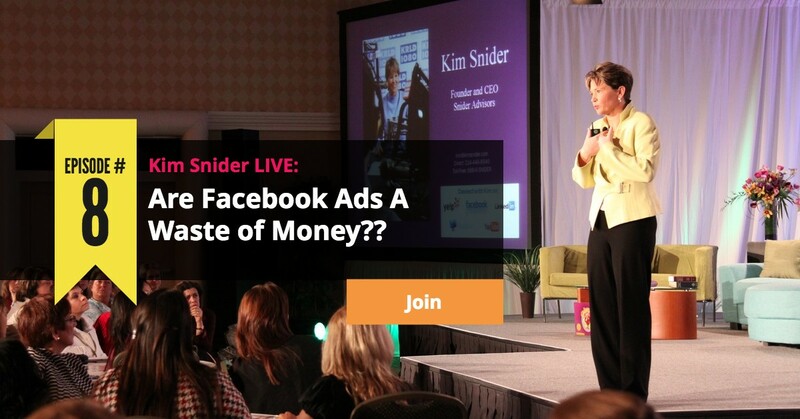 So, in this episode of Kim Snider Live, we will explore the question … Are Facebook Ads A Waste Of Money? Do a few people just get lucky? Or lie? 0:23 – Topic Introduction: A Question from a Facebook Post: Are Facebook Ads a Scam? 2:43 – Go to www.sync2crm.com/ep8 to get the cheatsheet for this episode! 4:12 – Main content start, has Kim actually bought anything from a Facebook Ad? 9:10 – Kim’s points on why Facebook Ads aren’t a scam. 11:00 – Do Facebook Advertisers get a positive ROI? 12:00 – How does the research on digital marketing show the outcomes of Facebook Ads? 16:31 – Marketing builds a relationship through Facebook, not direct sales. 31:45 – Conclusion and thank you! In this week’s Episode #8 Cheatsheet, I have rounded up all the notes from the broadcast plus any screenshots, links and resources that may or may not have been mentioned in the show so you have them all in one place. 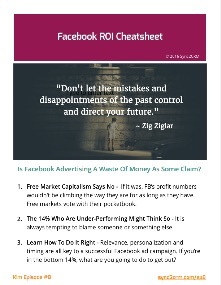 To download the cheatsheet, click the image below.